During the 19th Century people played instruments at home to entertain family and friends and the invention of an upright piano which sold for about £10, made them within the reach of a larger section of the population. 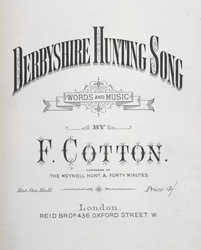 The Victorian middle and upper class's interest in piano and dance music was enormous and sheet music was produced at an outstanding rate, with some writers claiming to have produced thousands of songs. It is interesting to note that the lyrics of this song are written phonetically using local dialect, this makes it difficult for us to understand when reading it but it sounds fantastic when sung.